Sacramento Arena Deal is DOA… After a whirlwind of meetings between the NBA, the Maloof family and the City of Sacramento, the prospect of building a new arena for the Sacramento Kings is officially dead. In countless meetings held in locations all over the country, the Maloofs agreed on the terms initially laid out by all sides to build a new arena, structure financing plans and establish a timeline for build out. However, a number of empty promises from the Maloofs finally came to light as the owners did the Texas Two Step with the NBA and the City, revealing that the deal is not feasible, (even bringing in the family’s own economist to illustrate). Now Sacramento and the NBA both have egg on their face, and the public and the fans have more questions and doubts that the Kings will ever be viable in Sacramento. Along with the proposed new arena was the potential for a new wave of jobs – construction and permanent – as well as a start to the redevelopment of the Sacramento Rail Yards. A new arena would have meant new retail shops and restaurants as well as an onslaught of new homes. All of the redevelopment ideas will have to be put on hold while the City and Maloofs try to sort out their mess. In the meantime, the people of Sacramento are angry – some prominent business leaders are even calling for the ouster of the Maloofs and want new ownership to lead the Kings to prosperity… we will see what happens. Now onto some good news… Sacramento foreclosures of existing homes are beginning to slow. 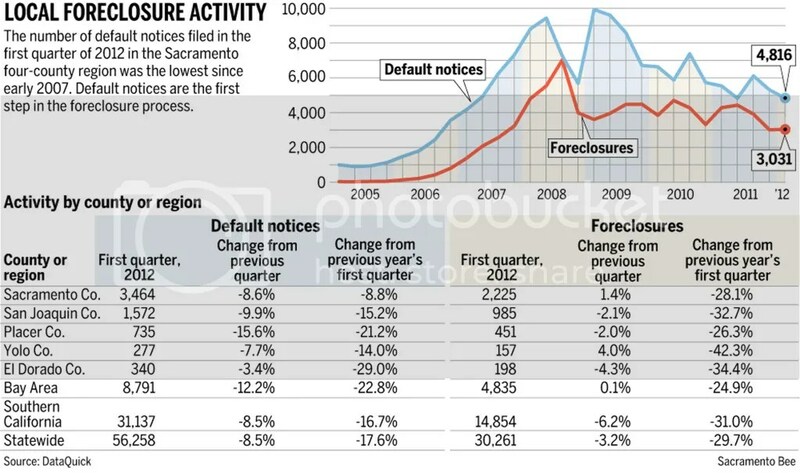 In fact, the number of default notices filed in the first quarter of 2012 is the lowest since early 2007. This should be welcome news for both home buyers and homebuilders alike. In the last several years, new homebuilders in the greater Sacramento area have been building and selling new homes with pricing that is in line with REO inventory, and in some cases even selling below it. As the REO product has been dumped onto the market, home pricing and new homebuilder margins have been steadily decreasing. The Northern California Team has even seen some builders impair lots that were bought just 18 months ago. With the change of wind direction in just in the last couple of months, builders have started to sniff around again looking for deals and build pipelines for 2013 and beyond. Furthermore, absorption rates have started to tick up as demand for new homes builds upward. It looks like Sacramento is finally coming out of the ashes and is ready to start the slow grind toward home price appreciation. This entry was posted in Northern California, Sacramento and tagged Absorption, defaults, Downtown Sacramento, Entertainment center, Foreclosures, home price appreciation, Kings new arena, Maloof family, NBA, New Home Pricing, NOD, pipeline, redevelopment, REO, resale inventory, retail, Sacramento Railyards by landadvisorsca. Bookmark the permalink.